Indian Navy, in January, issued a Request for Information to procure 57 multi-role combat aircrafts. 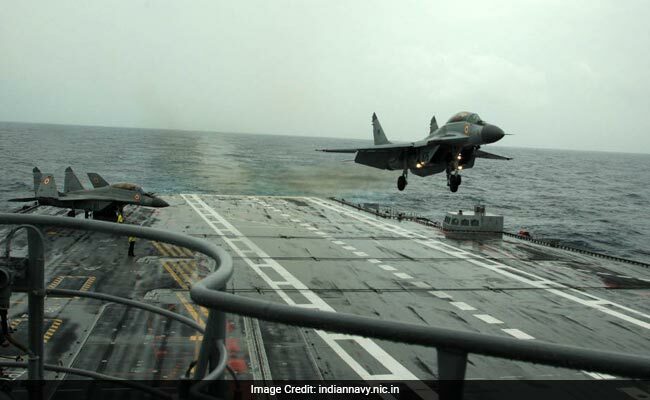 New Delhi: Four defence companies have shown an interest in providing the Navy with 57 multi-role combat fighter jets for its aircraft carrier, Admiral Sunil Lanba said on Wednesday. The Navy chief also said the Scorpene submarine Kalvari is going through its final phase of trials and should be delivered by August. Having rejected indigenously built 'Tejas' as too heavy, the Indian Navy in January issued a Request for Information to procure 57 multi-role combat aircraft for its carrier. "The Navy has got response from four players for the RFI. We will examine the RFI and take it forward," Admiral Lanba said on the sidelines of a seminar organised by FICCI on 'Building India's Future Navy Technology Imperatives'. He, however, did not disclose the name of the companies which have shown interest in the proposal. At present, the Navy operates 45 MIG-29K jets which face serviceability issues from time to time. Currently, six planes are compatible for aircraft carrier. They are Rafale (Dassault, France), F-18 Super Hornet (Boeing, US), MIG-29K (Russia), F-35B and F-35C (Lockheed Martin, US) and Gripen (Saab, Sweden). While F-18, Rafale and MIG-29K are twin engine jets, the remaining three have single engine. The delivery of deck based fighter jets is expected to take four-five years. The indigenously built aircraft-carrier Vikrant should complete trials in 2019. It was likely to be commissioned by 2020, Mr Lanba said. When asked about the recently approved Strategic Partnership (SP) model under which select private firms will be engaged to build military platforms like submarines and battle helicopters, Mr Lanba said the next step would be to identify strategic partners. "All three service chiefs will have to go and get the AONs (Acceptance of Necessity) on what we want to be built through strategic partners, so that partners in each segment can be identified... We are hopeful that we should be able to move this process in next six months," he said. Four segments - submarines, fighter aircraft, helicopters and armoured carriers/main battle tanks - were identified under the new policy, aimed at attracting billions of dollars of investment in defence manufacturing by private defence majors including leading foreign firms. The Ministry of Defence had recently scrapped navy's decision to appoint Flag Officer Delhi Area (FODA) and Flag officer Gujarat Naval area (FOGNA) without its consent. Responding to this, Admiral Lanba said, "We are in discussion with the Ministry of Defence and we will resolve it."